Gayathrini Premawardhana ’21, a summer communications assistant at CLASSE. Grace King, a rising Junior, majoring in Physics at Vassar College and studying Engineering at Dartmouth College, participated in the REU program at Cornell this summer, and her research project is quite timely, as CHESS and CESR are currently undergoing their biggest upgrade in decades. Grace King, a rising Junior, majoring in Physics at Vassar College and studying Engineering at Dartmouth College, participated in the REU program at Cornell this summer. Grace spent the summer of 2018 working on how to further improve the Cornell Electron Storage Ring (CESR) to produce brighter x-rays. The CHESS-U upgrade that is currently underway will increase x-ray brightness by up to 1,000-fold and King’s work could help increase this even further in the future. CESR was originally built as a high-energy physics collider and, therefore, had two counter-rotating beams which ran in two different directions. After the high-energy physics experiment was completed in 2008, it has been used mainly as a two-beam x-ray source. CHESS-U, which will begin commissioning this fall, is aimed at increasing the energy and brightness of these x-rays. The upgrade will replace 1/6th of the storage ring in the south-arc region where CHESS users conduct experiments. As part of the upgrade, the orientation of half of the beamlines will be reversed in order to accommodate a single clockwise beam. This will result in a single beam operation instead of two counter-rotating beams, making overall operations of CESR easier. The magnets in this section will be replaced with six double-bend achromats, which will reduce the horizontal emittance to around 30 nm-rad, making brighter x-rays available to researchers. As CHESS-U replaces 1/6th of CESR, the remaining portion of the ring will not be touched, contributing to most of the emittance of the beam. If the remaining portions of CESR are to be replaced, the emittance could be drastically decreased, under 3nm-rad. This prospect may seem inappropriate to conceive while in the middle of a major upgrade, but in order to stay competitive in the international world of lightsources CHESS needs to think past CHESS-U, even decades into the future. The quickly approaching 30nm-rad emittance of CHESS-U is certainly a bright beam and will undoubtedly lead to new cutting-edge research. However, as CHESS utilizes its upgraded facility in the near future, other labs will be performing their own upgrades. In the world of competitively-funded lightsources, this process demands thinking years ahead. CHESS and CESR are already envisioning how a future upgrade could reduce the emittance of their beam even further, which could be done through a potential opportunity that lends credit to the close collaboration of US research facilities. In 2022, the entire storage ring of the Advanced Photon Source (APS) at Argonne National Laboratory will undergo an upgrade to a fourth-generation light source. This will require removing and replacing all of its existing magnets. Within their 1,100-meter-long storage ring, there are magnets that could be compatible with CESR, maximizing its potential. But how well would they work within the CESR lattice structure? How far can CESR improve by reusing these magnets? This is where Grace King’s summer research has come in. While various ways of upgrading CESR having been in discussion for several years, this particular method was first imagined in 2017, shortly after the APS upgrade was announced. Jim Shanks, King’s mentor, and Mike Ehrlichman, CESR research associate, are the driving forces behind this exploration. Shanks would like to see just how much the emittance can be decreased in CESR. But initial steps need to be taken. “Ultimately, what would be really cool is if we could get something put together to bring to a workshop on the future of light sources in the United States. If APS is throwing away these magnets, we can take them and build a world-class light source with them,” he says. As a CESR Research Associate and mentor, Jim Shanks works with Grace King to think about the potential for another CESR upgrade. 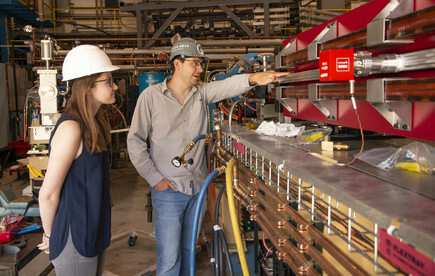 Jim Shanks and Grace King inspect the magnets that are going into the upgraded portion of CESR. The idea is very much in its infancy. However, King’s research will help the team determine if this is worth pursuing. King is researching different possibilities of a ring lattice structure that would incorporate these magnets being repeated around the remaining 5/6ths of the storage ring. Her goal is to have two different structures, the Theoretical Minimum Emittance (TME) cell and the Anti-Bend Cell (ABC), designed, placed in CESR and fully optimized to produce a beam having as low an emittance as possible. The ABC could decrease the emittance below 1 nm-rad. For each of these structures, King first designs a layout on paper and then writes code to produce digital designs. She uses these to simulate the response of the beam’s emittance to changes in different parameters, such as magnet strength and position. Structure of the full TME lattice after being matched into the CESR Tunnel. 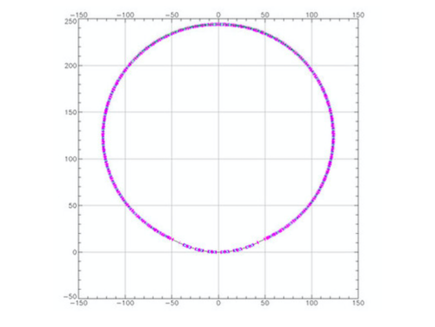 The tunnel is shown in green, quadrupoles in pink, and dipoles in blue. King is the first undergraduate to be engaged in this project to this depth. Shanks has provided her with reference materials, guided her through designing, introduced her to optimization tools and theoretical accelerator physics concepts, all while explaining the parameters to be optimized. Basically, he is helping her design a fully functional storage ring starting from the magnets. “Jim does a great job explaining things and helping lay out a good step-by-step framework while allowing me to test my strengths and figure out stuff on my own,” says King. 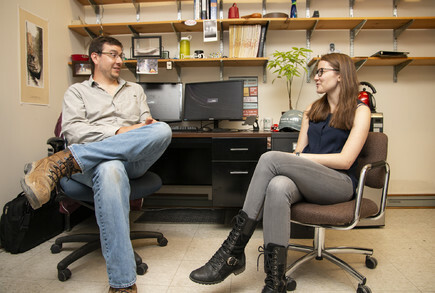 It is no small task to design and optimize a storage ring from the ground-up, and King says she appreciates that she has learned a great deal everyday during her time at Cornell. Grace had to learn a whole new programming language so that she could write the necessary code in order to build the theoretical machine. Once she had written the code, she had to learn how to use it and run the optimizer. “Two weeks ago, I didn’t know what any of this was,” she explains, partway through her summer. “I didn’t know how to use the programs that I’m using to code, I didn’t know anything about accelerator physics.” Her work keeps her actively engaged too. “[It] is a pretty cool thing to be working a 9 to 5 job and not feeling like you’re bored at all!” she says. Being a student of both physics and engineering, Grace chose this project because it was a combination of both of these disciplines, involving the actual building of something in addition to the essential physics behind it. “Rather than being strictly theoretical, it has very tangible applications,” she says. Besides having learned a new programming language and being introduced to a novel area of physics, King says that working on this research has immensely improved her problem solving skills. Her experience is helping her become a more independent, skillful and confident physicist. While at the same time, she has contributed to expanding the capabilities of CESR with leaps and bounds.